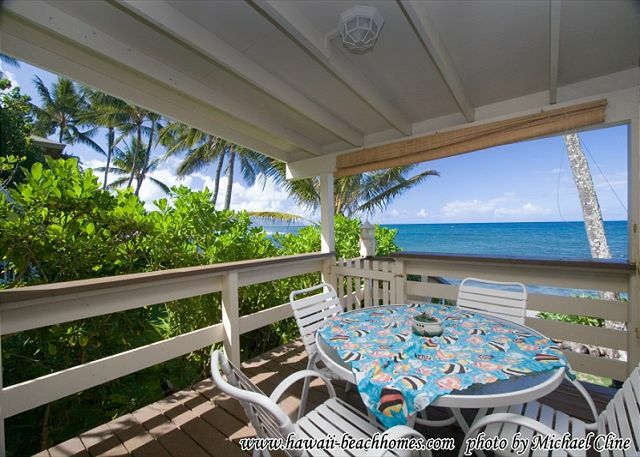 Get a sense of “Old Hawaii” in this charming 3 bedroom, 2 bathroom beachfront home. 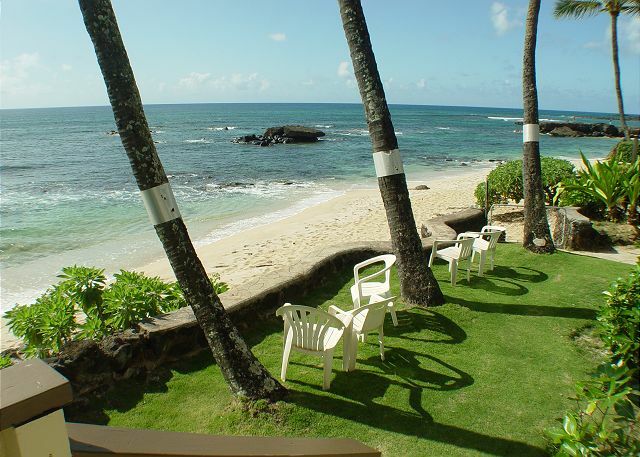 Spend your days watching the waves or magnificent sunset from the beautifully manicured lawn. 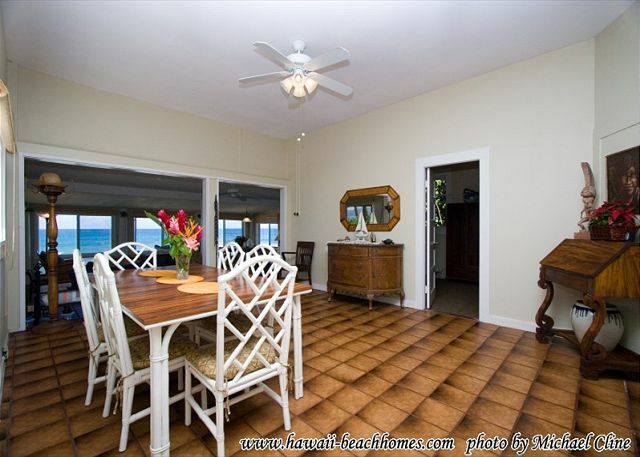 Enjoy meals, cocktails, and conversations in the spacious living/dining area with the ocean in the background. 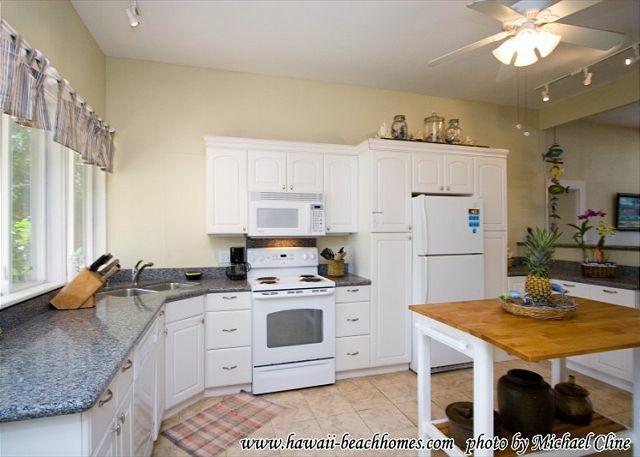 Three Palms is equipped with a fully stocked kitchen, everything you need to prepare home cooked meals. 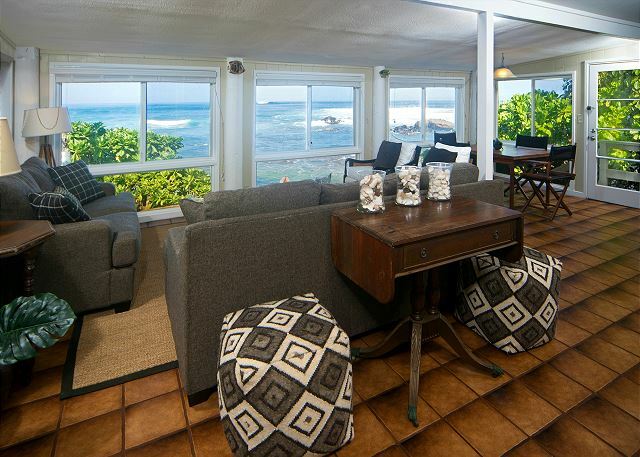 Open the sliding doors to let in the natural sea breeze. 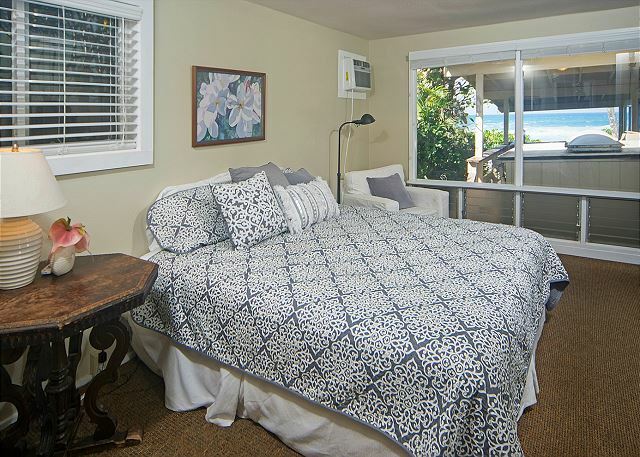 A/C in bedrooms offer guests extra comfort on warmer summer nights. Don’t be surprised if you see a turtle or two sunbathing right on the beach. 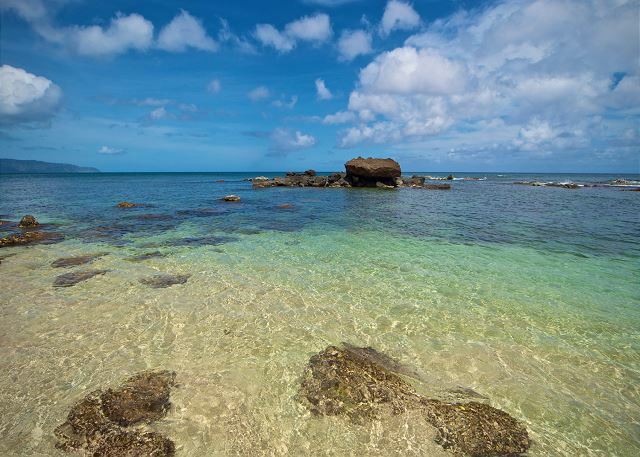 Although you can snorkel at the beach outside, it is not recommended you do so in the winter months. 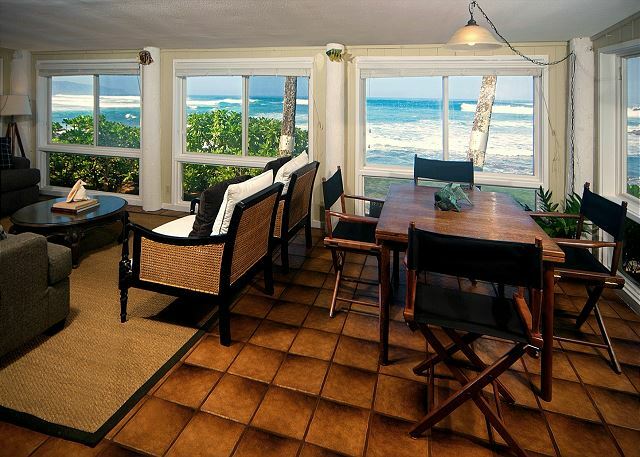 Popular surf breaks like Alligator Rock and Leftovers are accessible right in front of the house. The beach is nice and sandy, perfect for laying out and reading a book. 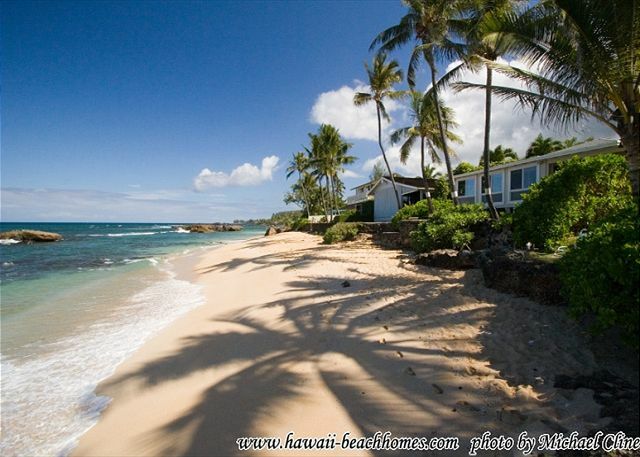 Three Palms is located halfway between Haleiwa and Pipeline. Near loads of excellent food trucks that assort from acai bowls to fish tacos. 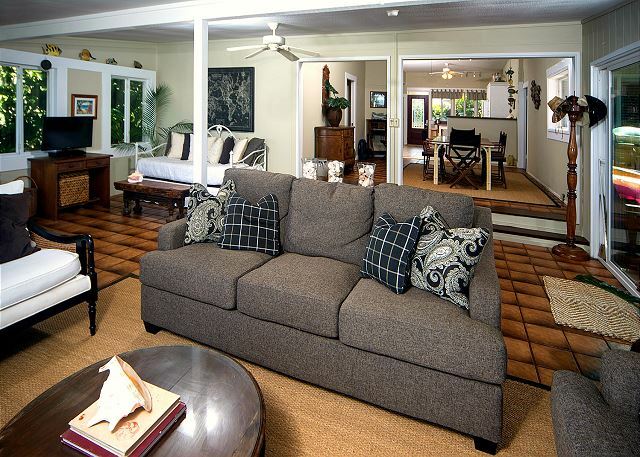 Formal dining options are located nearby Turtle Bay Resort, as are two premier golf courses. 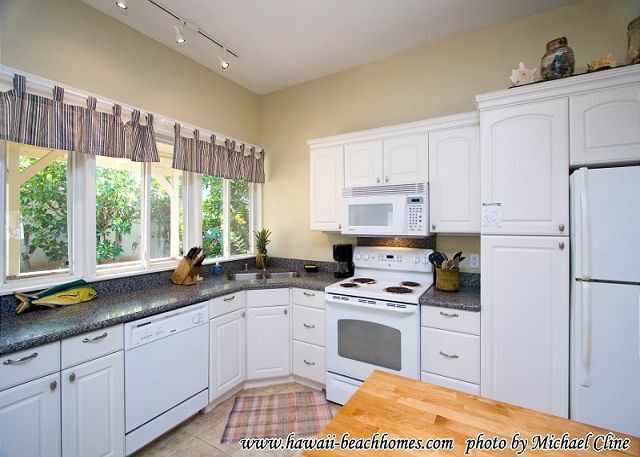 The surfer town of Haleiwa is located close by for shopping, galleries and dining. 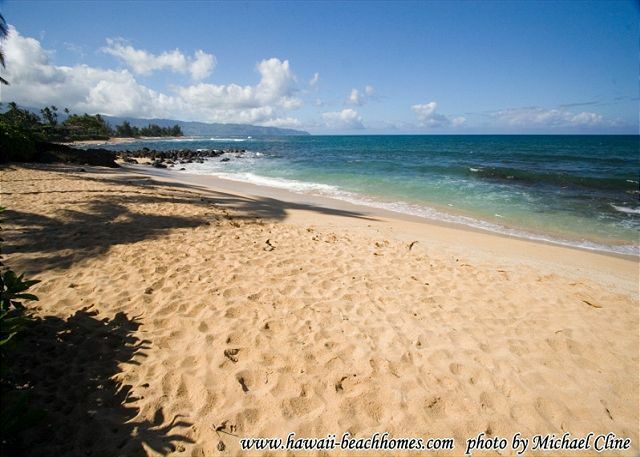 Other nearby attractions include Waimea Falls and Sunset Beach. Other: Day bed in living room. Pack n plays, cribs and kids beds can be rented and delivered. AC in bedrooms only; fans throughout home. We loved the time we spent at this house and regret not staying longer. Everything was as described and depicted in the pictures. It was so relaxing to be right on the beach and to experience turtles visiting every day. Manager Response: Mahalo for staying with us, Whitenack Family! We are so happy you enjoyed your time here. Charming house with a great location!! We had turtles on the beach everyday and had a wonderful vacation. Manager Response: Thank you for staying with us and for taking the time to write a review! We are so glad you got to hang out with the turtles. The beach here is quite private, and there are a few sea turtles that love to hang out here away from the crowds. My family of 6, very much enjoyed the beach view from our holiday house. Felt like oown paradise.... right in our backyard. We have 4 children, the house was big, clean and overall happy vibes. Manager Response: Thank for your taking the time to review, Bun Family! Mahalo for staying with us, you were all perfect guests. Hope to see you again! I was very happy with our stay. House was very spacious which was great, gave our two young children lots of room to run around in the evening. Easy access to the beach. Lots of on site parking. 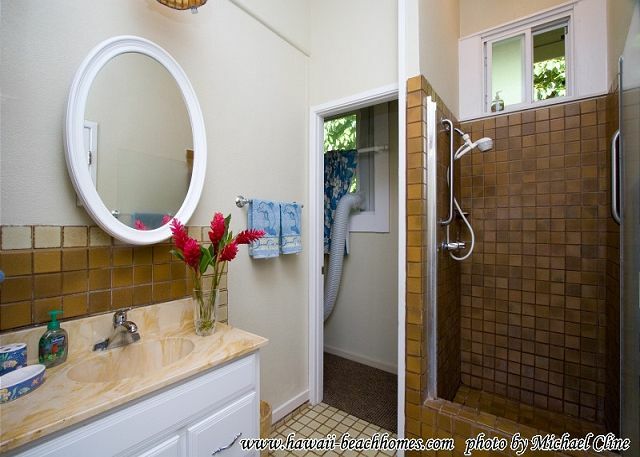 The only thing I didn’t like about the house was the bathroom situation. 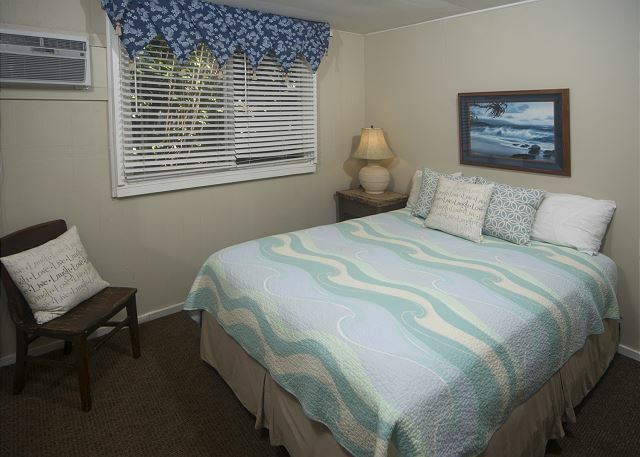 Both bathrooms are located in the bedrooms, making it a little inconvenient if you were to have guest over or whoever had to sleep on the extra beds in the living room. Other than that everything was great and we’ll definitely be booking this house again. We had a wonderful stay at Sunset and Sea Turtles! The moment we arrived there was a sea turtle sun bathing on the beach right out front...such a perfect welcoming! 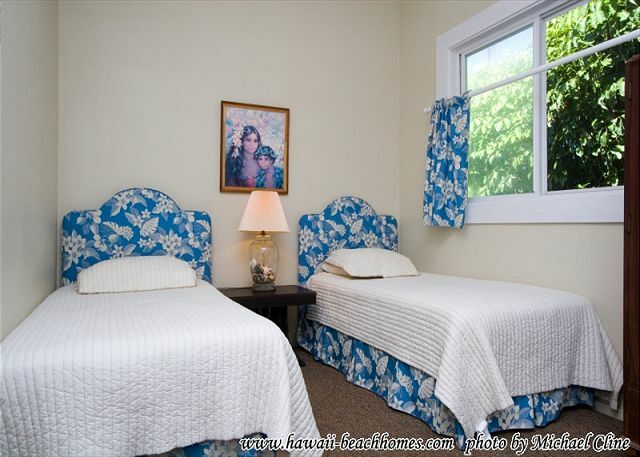 The home was clean and well equipped with amenities. I do an annual north shore trip with 5 women and we had such a great time. We had booked a different rental that had cancelled on us one week prior to our departure. LUCKILY sunsets and sea turtles saved the day with their last minute availability! We are so grateful! The location couldn't be better. We had a perfect beach all to ourselves! Although it was the second stay, it was a very wonderful experience as we did last time. It is addicted to becoming a feeling of living in Hawaii. The weather was nice, the house was clean and comfortable. I bought out at nearby FOODLAND and also did BBQ. Although the hot water of the shower ceased to come out, it was healed immediately. 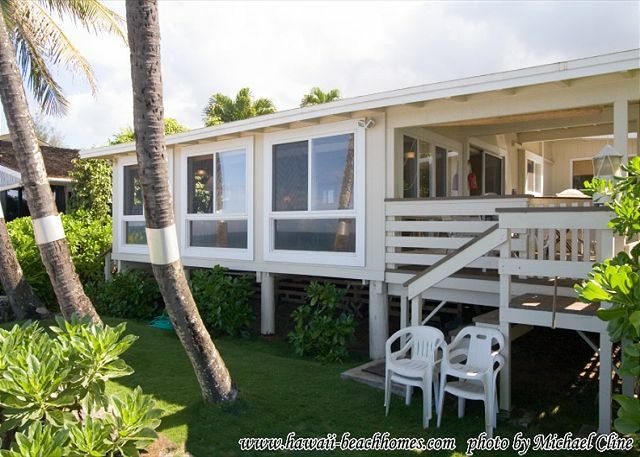 I am planning to use HawaiiBeachHomes again for the next Hawaii trip. Terrific location with easy access to everything we wanted to do. Beach a little rocky, but still able to swim and snorkel. Older Home, but what we wanted. We loved this house. When you open the door and look out it feels like you are on a house boat! The house was clean and had everything we could want. Our location was amazing. Immediately in front of the house is an opening to swim without any rocks. We swam, floated, used our SUPs and snorkeled every day. Two turtles hung out with us and even came up to sunbathe with us a couple of times. We would definitely rent this house again. We loved the little yard between the house and the beach where we would sit and enjoy the waves every morning and every night. Sunsets were beautiful! DID NOT WANT TO LEAVE! I honestly can't think of a negative. Great location right on the beach. Turtles came up on the beach. The house itself could use a refresher, a bit rundown & in need of a coat of paint, carpet cleaning, etc. Fantastic property management, the refrigerator went out on a Sunday afternoon & a new one was in place the next morning. This was a beautiful location just behind a nice little reef facing west. We had beautiful sunsets, fish to see snorkeling, even a sea turtle sunning itself on the beach one morning. Honestly, you could hear the waves and evening storms from every bedroom, I haven't slept so well in years. Overall good times were had. The house was in decent condition, clean and just fine for a rental. Management was informative and responsive anytime someone came by for maintenance or an issue popped up. My only "complaint" for this place would be driveway access on mid afternoon. Just back in when you can, or face a daring dash out :) the traffic is crazy with the beach down a ways popular with sea turtles and tourists.